Film-maker Chris Tangey of Alice Springs Film and Television was filming a wildfire in Curtin Springs, Australia, when a small twister touched down causing it to build into a spinning flame. Just 300-meters away was a 30-meter high fire swirl which 'sounded like a fighter jet' despite there being no wind in the area. The so called fire tornado or fire whirls generally form when superheated air near the surface of a large fire zone rises rapidly in an airmass where sufficient horizontal or vertical vorticity (spin in the atmosphere) is also present. Much like a dust devil or whirlwind, the rapidly rising air above a wildfire can accelerate and turn the local vorticity into a tight vertical vortex, now composed of fire instead of dust. 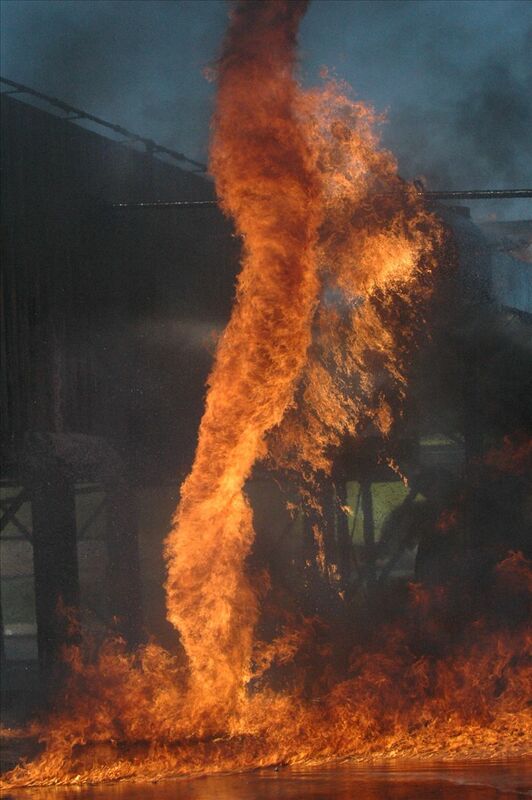 Most of the largest fire tornados are spawned from wildfires. They are usually 10-50 meters tall, a few meters wide, and last only a few minutes. However, some can be more than a kilometer tall, contain winds over 160 km/h, and persist for more than 20 minutes. The tornado that Tangey caught on camera reportedly lasted for more than 40 minutes. An extreme example of fire tornado is the 1923 Great Kantō earthquake in Japan which ignited a large city-sized firestorm and produced a gigantic fire whirl that killed 38,000 in fifteen minutes in the Hifukusho-Ato region of Tokyo. Another example is the numerous large fire whirls (some tornadic) that developed after lightning struck an oil storage facility near San Luis Obispo, California on April 7, 1926, several of which produced significant structural damage well away from the fire, killing two. Thousands of whirlwinds were produced by the four-day-long firestorm coincident with conditions that produced severe thunderstorms, in which the larger fire whirls carried debris 5 kilometers away. Video of the fire tornado Chris Tangey recorded below. A popular photo of unknown origin.